I'm reprising the Alphabet Challenge tonight and reviewing Estrella Inedit. This was one of the first beers where I really thought I knew what I was talking about when I was talking to other beer geeks. So for me it's a beer that holds a special place in my memories. This beer was designed with Ferran Adria to compliment his food at El Bulli, at one time the world's top ranked restaurant. I've actually review this beer before, way back at the start of my blog in December 2011. You can read that review here, hopefully my palate has evolved a bit and I can pick up some more intricacies. 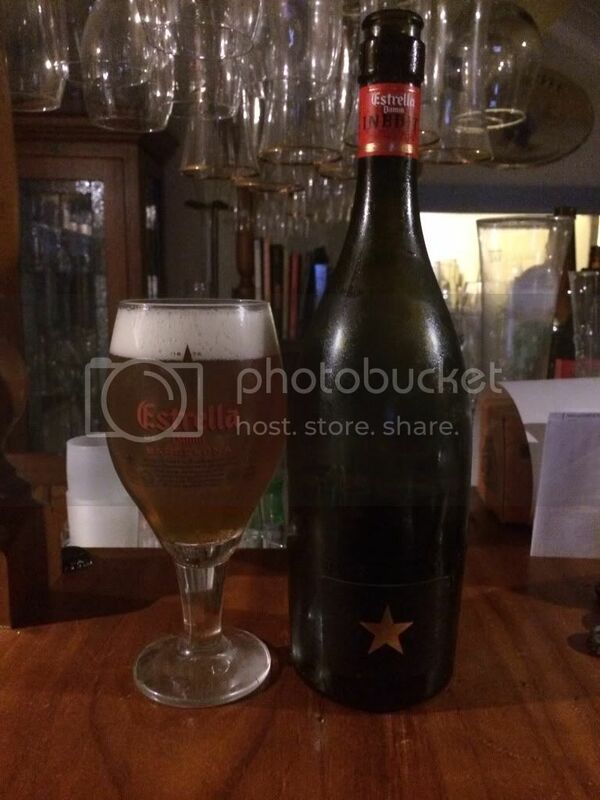 Estrella Inedit pours a little darker than your average but still with that characteristic cloudiness. The head is brilliant white, although very aerated. Accordingly the head's retention is quite short lived, fading to a small ring within a minute or two. It's not the prettiest looking beer in the world but it's also awful, when it's first poured it looks excellent! The nose is really delicate. The malt base seems like mostly wheat, which surprises me a little, with light pilsner malts also present. I can smell plenty of citrus, with orange peel very prominent and zesty. As the beer warms the aroma becomes more herbal, with coriander the only one I can distinguish for sure. A nice peppery spiciness finishes the nose, it's more reminiscent of a Saison than a Witbier. Unexpectedly the most notable element of the flavour is the coriander, it's far more prominent than the aroma would have indicated. The malts are light as expected and there is plenty of citrus - mostly orange peel. It has a particularly dry mouthfeel, somewhat reminiscent of a Saison just without the Belgian yeastiness. It's a very drinkable beer which really lends itself to eating with. Please note I did review this beer with food. I can't explain it but by itself, Estrella Inedit is not a great beer. With food it's a totally different beast! I mentioned in my last review of this beer that it should be on every restaurant's beer list in Australia, I stand by that comment. This beer is one of the best beers to compliment food that I've come across. If you come across it grab some, it's great value for the price and the quality!